We had an uneventful trip to Carriacou (CARRY – a –koo), checked in at Hillsborough, the capital, and motored around to Tyrell Bay. Our Doyle guide book says “Carriacou is the only place where I have ever seen a pelican sitting on a buoy with a seagull on his head, both appearing quite content in the afternoon sun.”This really sums up the laid back pace of the island. 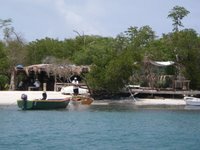 Carriacou is renowned thru out the Caribbean for its boat building. The colourful Carriacou sloops with their long booms extending out over the stern are seen competing often in inter-island regattas. We hooked up with our friends Mike and Kylie on “Meggie” once again as they were waiting for parts to arrive before they sailed to Venezuela. We enjoyed catching up with them again and I got to try some new-to-me traditional West Indian food on them; Stuffed Christophene au Gratin and fried plantains (credit for both of these recipes go to “Embarrassment of Mangoes” written by Ann Vanderhoof). It was delish and everyone loved it. We enjoyed a couple of days in Tyrell Bay relaxing and doing odd jobs and practicing Spanish (for Venezuela) before sailing to Grenada. We had a great sail down the windward side of Grenada. It was blowing 22-25 knots, and we were on a broad reach to a run all the way averaging 8.5 knots and we saw 10 knots. We might have gone even faster if it wasn’t for all of the beer, wine and canned good stuffed into our lockers. We are pretty heavy right now as we continue to stock up for our trip to Venezuela as we have been told there are a few thing s that we might not be able to buy such as eggs, milk, flour, peanut butter (I know it’s hard to believe but PB is really only a North American phenomena), toilet paper, etc. After our exhilarating sail we arrived at Prickly Bay where about 50 boats were anchored. We gave MS a good fresh water bath and then headed in just in time for Happy Hour. Beer; $3EC = $1US. WooHoo! 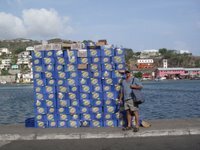 Next morning I went for my usual jog/walk combo and fell in love with Grenada, known as the “Spice Isle”. Grenada is a fairly well to do, pretty island that has a medical university that is well respected, a good infrastructure, and has become a favourite second home for the English who build large, elaborate homes here. 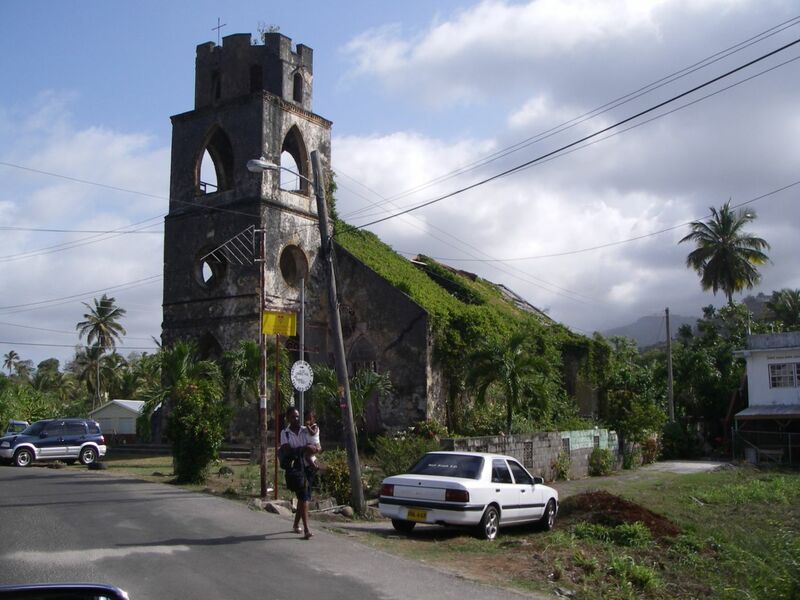 Before Hurricane Ivan in 2004, Grenada also relied heavily on their spice exports, primarily nutmeg. Unfortunately, Ivan wiped out the nutmeg industry and Grenada lost its status as the world’s number one producer of nutmeg. This is slowly being rebuilt but it takes a very long time (12 years, I think) for a tree to mature enough to start producing the nutmeg again. I quickly noticed on my walk that the streets are very clean and I did not see garbage strewn around as I have seen in many other largely populated islands in the Caribbean. We took the very inexpensive and frequent bus to a real mall (!!) the next day. We ate lunch in the food court! At home we would never dream of having lunch in a food court of a mall but we loved it here! There was even a KFC here. We hadn’t seen or ate fast food in so long it was a real treat. We went to an I.G.A. (!!) grocery store. I was so excited I wanted to buy everything that I hadn’t seen for so long but we had to take the bus back to the boat and we couldn’t carry very much…..but I would be back with a BIG list before we left. We hit the St. Georges fish market too. We had never seen fish so big and the ladies that hawked the fish were also very impressive. They could have won arm wrestling contests with the biggest, strongest guys we know but they were all real sweeties. The next day we arranged to do an island tour with Cuddy’s Taxi & Tours. Cuddy is a local fellow who is very proud of his island. He picked us up and 6 others at 8 a.m. and he spent a very full day showing all of us around in his very well cared for recent model van. As we drove around the island to each destination Cuddy would tells us the history of the island and its people. Grenada does not get hit by hurricanes very often, every 50 years or so it seems, and the island was once considered to be out of the hurricane belt by insurance companies but that is no longer the case since Ivan in 2004. Cuddy told of us of the devastation Ivan left behind and we took pics of many buildings (churches, schools, etc.) that were demolished. Cuddy also explained which buildings the different countries donated money and supplies to help rebuild. As we are Canadian he thoughtfully pointed out each building in particular that we financed or our volunteers helped to rebuild which made us very proud of our country (turns out it’s true! Everyone really does love and respect the Canadian people). 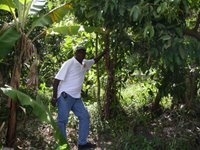 Our tour was reminiscent of Dominica in that Cuddy would pull over and grab fruit or spice from a bush or tree by the road side and share with everyone in the van. Pretty much every spice you can think of grows wild here; cinnamon, nutmeg & mace, cloves, turmeric, saffron, cilantro/coriander, lemon grass, cocoa, etc. I am sure to have forgotten some. Cuddy took us first to Annandale Waterfalls which are not very high but they are breath taking to see. The foliage is incredibly beautiful (we took lots of pics) and because of this beauty it feels magical which was made even more so by the South American nuns who were visiting at the same time (kewl!). We met the longtime resident, a Mona monkey, who loved attention and getting her fur stroked. She was beautiful and very friendly and I could have hung out with her all day. All of the cute, well mannered, primary school children, wearing their uniforms loved to touch and pet her also. On our drive around the island Cuddy pointed out small houses of no more than 150 square feet made of clapboard and explained to us that some were called “Janet Houses” and newer ones were called “Ivan Houses”. These houses were built as temporary shelter for people who were left homeless after Hurricane Janet went thru in the ‘50’s and then Hurricane Ivan in ‘04. However temporary they might have been people still live in them today. Cuddy told us how he grew up in a Janet house with 15 other siblings!! Thank goodness for a tropical climate as they would not all have fit into the house at one time as there is room only for a small cooking area and perhaps one cot. Cuddy drove us thru the rainforest to Grenville, Grenada’s second largest town, where we enjoyed a traditional West Indian lunch of roti, lambie (conch), and jerk chicken with Carib beer. After lunch we walked thru the town of Grenville past many colourful fruit stands and fish roti stands to a nutmeg processing plant. We learned how the nutmeg is processed by removing the mace from the nutmeg and drying the mace and nutmeg separately. 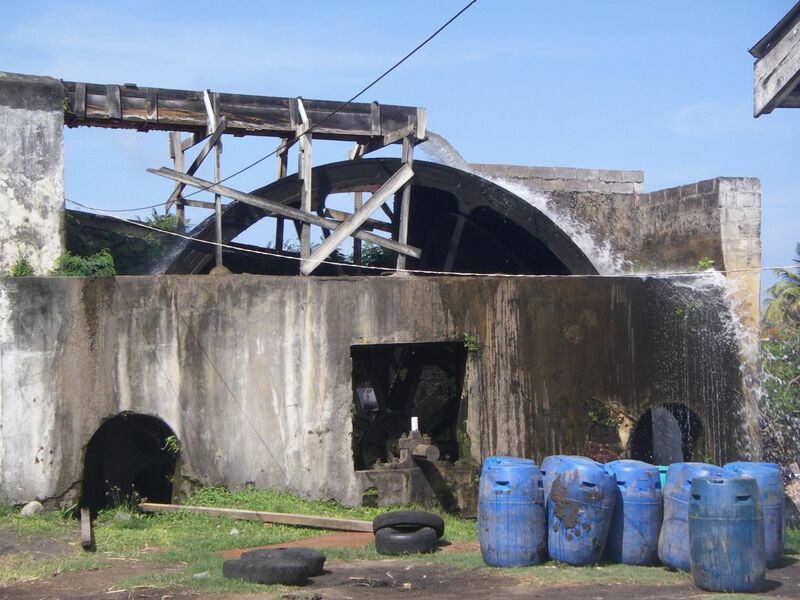 The plant used to employ 140 island locals but since Ivan only 12 people still work there. It was fascinating to see but we left feeling a little saddened. You could hear the pride in our guide’s voice when he showed us around the plant. 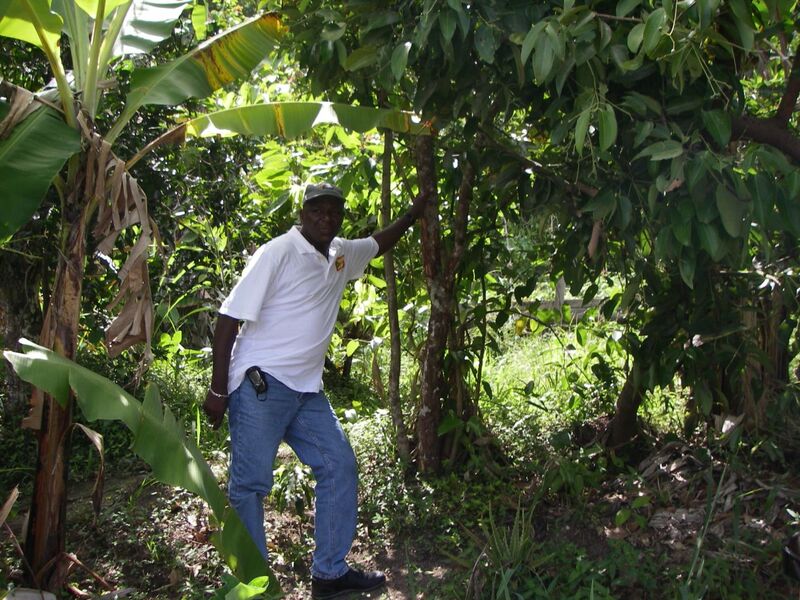 We could also see how saddened he was that Grenada no longer holds the title of the largest producer of nutmeg in the world. Number one now is Thailand and it will take Grenada a long time to regain their title. After the nutmeg plant Cuddy took us to River Rum Distillery, one of the only rum distilleries that still operate the old fashioned, traditional way. It was interesting to see the sugar cane get pressed using the ancient water wheel and seeing the juice be extracted via this method. Then the juice is boiled in large vats and then left to ferment until it turns into rum. River Rum Distillery produces a number of types of rum, very strong alcohol content (probably tastes close to white lightning! ), and a sweet rum punch not to mention a few others in between. On the way back to our drop off point Cuddy stopped at a volcano lake atop of a mountain (old volcano actually). The lake looked serene and it was hard to imagine how it would have boiled with heat. Needless to say after all of our adventures of the day we were happy to get back to the cat and put our feet up after an especially rewarding day of learning about this wonderful island and its people. Grenada was in the middle of an election during our stay there with the Election Day falling on July 8th. It seemed everybody had a strong opinion on who should win the election. The ruling party had been in power for 15 years and it seemed the bulk of the population was ready for a change. Cuddy explained to us that the existing Prime Minister, Dr. Keith Mitchell, had just been indicted in an international court in New York City for a number of illegal transactions. Also, apparently, there were many other events that had angered the Grenadians; such as stealing money from the country’s coffers to make side deals, for which he had been caught red handed, and also to pay for fancy Escalades and trips to Europe. In fact, if the ruling Prime Minister did not win this election there was talk that he would leave the country and hide as he would have to answer the charges against him in the international court. After 15 years of this corruption people were ready for the “yellow party” to replace the “green party”. It was interesting to listen to the different views and to see all of the BBQ’s and festivities people attended almost daily to support their party. Cuddy’s favourite phrase was “You can’t enjoy a green banana until it turns yellow!” People were also replacing “Hello” with “Yellow” everywhere we went. It was quite humorous. After a couple of days at Prickly Bay we decided to move over to Hog island anchorage which is a favourite of many cruisers. 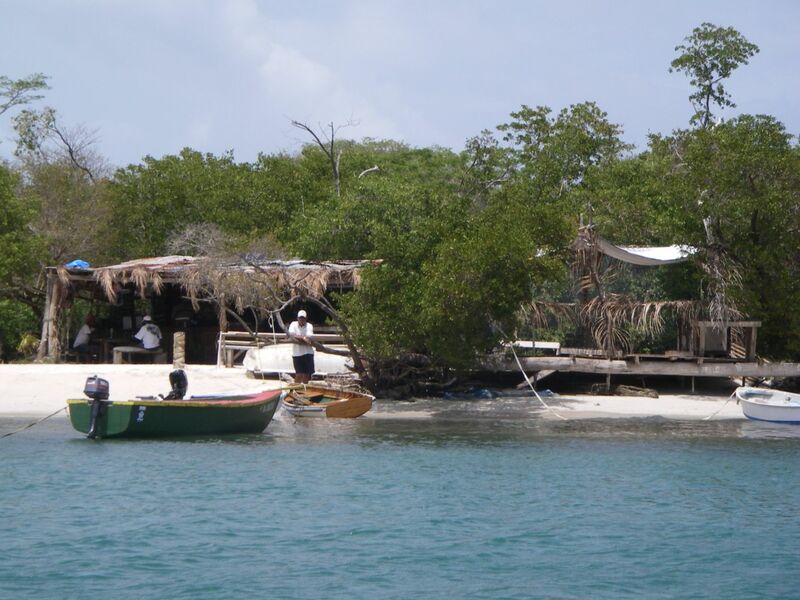 It is not necessarily beautiful but it is very safe in bad weather due to the reefs that surround the island and the mangroves that boats can tie to if necessary. There is also a real feeling of community. Roger is a local fellow who has a beach bar and hosts many parties, including every Sunday a beach BBQ for all of the cruisers. On Wednesday’s its BBQ hamburger nite at Clarks Court Marina which is just a short dinghy ride away. Plus Clarkes Court Marina hosts the ever important Happy Hour every day, which is always very well attended. LOL! After all that excitement we were all ready for a cold drink and it was Sunday so that meant Roger was hosting his Sunday Beach BBQ. It was nice to meet all of the people who had come out to help Bontekoning and we were proud of the response of all of these people who dropped everything to try and help Bontekoning. What goes around comes around. Someday we may be in need of help and we hope people will help the way all of these people had. So we toasted ourselves and talked about how wonderful we were for the rest of the evening. LOL! We had been told that while we were in Grenada we must see the leather back turtles come to nest and lay their eggs. The best place to do this was Levera Beach on the north eastern shore of the island. It is best to see the turtle at nite as this is the turtle’s favourite time to come out of the crashing surf (they seem to always prefer the windward beaches) and haul their great bulks up the beach until they find “the spot” and begin to dig in the sand with their back flippers. Our turtle was the size of our 12 foot dinghy and we estimated that she weighed 800-900 pounds. Her head was the size of basket ball. We all quietly watched, careful not to make any noise as she dug her nest. This is truly amazing as if you have ever tried to dig a hole in the sand as it always caves in on itself but she scoops out the sand very carefully and it never caves in. She digs until she can no longer feel the sand to move it out of the hole. This hole is about as long as your arm and quite narrow. When she is done the hole she begins to lay her eggs. The first 40 eggs or so look like ping pong balls but in reality they are not fertilized eggs at all. 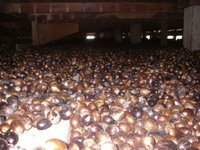 They are meant to cushion the fertilized eggs that are laid next. She will then lay as many as 145 fertilized eggs at one time! The turtle will come to shore three times during the season to lay her eggs and she will not lay all of her eggs at once. You know the old adage, “Don’t put all of your eggs in one basket”, in this case, nest. After she has laid her eggs she will put more of the “ping pong eggs” on top again to cushion the real eggs and then she commences to cover up her handiwork with sand. This whole process can take many hours. We were not allowed to take photos as the light would distract her and cause her to go back into the ocean without laying her eggs. The eggs would then never be hatched as she would not try again to lay them again. We were very excited to see two teeny tiny hatchlings (no bigger than a half dollar) struggling to make their way to the ocean surf. It is hard to believe that these tiny little creatures can become the size of a Big Momma. Unfortunately, they don’t stand much of a chance of survival. The birds eat them and the fish eat them. They’re lucky if they even get that far as the locals eat them before they are even hatched. Turtle eggs are considered to be a delicacy even tho the turtles are nearing extinction. An animal that has survived 65 million years (since the dinosaurs) is almost extinct. It is hard to believe. It takes 2500 hatchlings for one to survive. That’s not very good odds, is it? While we were at Hog Island it just so happened that my birthday was fast approaching (as it does every year! ).I was turning 40 (eek! where did all of the time go?) and it turned out that John from “Sea Witch”, who was turning 65, shared the same birthday. What a great excuse for the anchorage to have a party. We held a big potluck party on the beach complete with karaoke and birthday cake. What more could you ask for? The next day after the birthday party we had another party we planned to attend at the Friday nite Fish Fry in Gouyave. 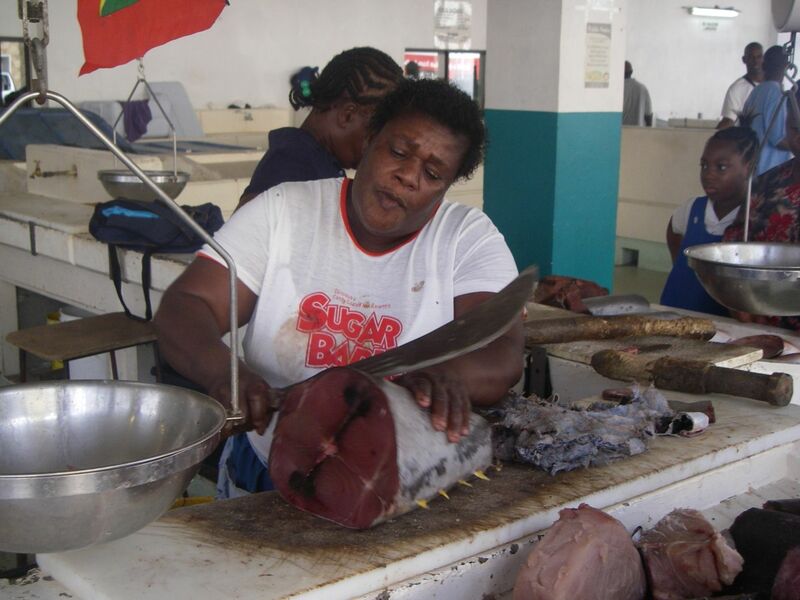 Every Friday nite Grenada celebrates the fishermen by hosting a street party with street vendors filling the streets selling fried fish, boiled fish, steamed fish, fish soup, fish pizza, (many different types of fish, cooked every which way you can think of), callaloo soup, land crabs (!!) in many different recipes, shrimp stir fry, coo coo (Caribbean style polenta made with corn meal and fried), and of course, lots of rum. It was a fun party and we ate a little bit from each vendor trying all kinds of interesting food. We weren’t too sure about the land crab pasta with the callalloo sauce, however. The meat from the body of the crab is removed and used in the recipe as well as the little crabby legs which were quite crunchy and a bit finicky to get the meat out of. We had been in Grenada for one month and tho we would have liked to have stayed longer in this beautiful, friendly island it was time to move on to Venezuela. We had made sure we had loaded the cat with items that we were told we could not purchase in Venezuela and we made plans for an over nite passage to Los Testigos (The Witnesses). Stay tuned for the next log all about Los Testigos and Margarita Island, Venezuela. Till that time, fair winds. 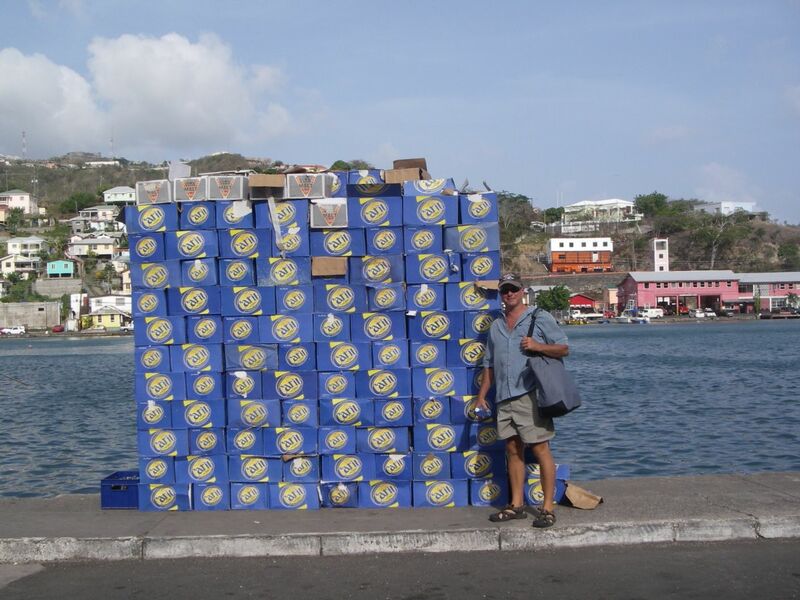 Just a quick note, while we were in Grenada Doug thought he would convert all of the heads over to electric from manual. What great news for all of our guests who could never quite master the manual pump toilets. Good news for Doug too as he would not have to unplug heads anymore!